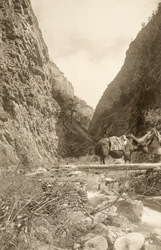 Photograph of a yak and rider crossing the bridge across the gorge beyond Lingzhi Dzong in Bhutan, taken by John Claude White in 1905. This is one of a set of photographs documenting White's mission to Bhutan to present the insignia of Knight Commander of the Indian Empire to Ugyen Wangchuk, the Penlop (Governor) of Trongsa in central Bhutan. Lingzhi is a sub-district within the Thimphu Dzongkhag and is situated in the far north-western corner of the country, a remote frontier post. The isolated region is accessed by means of a pass over 4500 ms (12500 ft) high. There are villages around the fortress of Lingzhi Dzong at about 4000ms. The Mission would have arrived at Lingzhi only after trekking (using yaks as pack animals) across high passes for several days. The yak is a species of well-built ox ideally suited to living at these high altitudes (even found at 6100 ms or 18500 ft). The large animals can stand nearly 6 feet tall at the shoulder, with male adults weighing over a ton, and females a third less. Domesticated in the Tibetan plateau for thousands of years, yaks are kept in herds by nomadic Bhutanese herdsmen. It is presently an endangered species because of excessive hunting for its meat and coat.